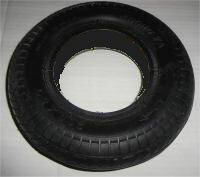 AIRLESS TIRE 8 inch SCOOTER TIRE (200 x 50 metric), for Front or Rear Use OUT OF STOCK! plus shipping/handling Availability of this item? PLEASE CHECK FIRST. Actual dimensions: 7 5/8" diameter, 1 7/8 width, 4 inch diameter center for rim. Never have flats again! This is NOT a hard rubber or plastic tire that will wear out and get flat spots! This is a soft, but long life tire like automobiles use, filled with a new composite type (replaces old foam type) material that has been tested extensively, a heavy duty tire for both front or rear tire replacement. The best flat-free tire ever produced for ELECTRIC and GAS SCOOTERS. Rides like pneumatic air filled tires, but won't go flat or need air ever!!! Not the same plastic composite tire sold elsewhere for less! Handling is added during processing and adjusted or refunded for quantity orders. AIRLESS TIRE 8.5 X 2 OUT OF STOCK! This hard to find tire is available while current limited quantity lasts! Order Now!!! Never have flats again! This is NOT a hard rubber or plastic tire that will wear out and get flat spots! This is a soft, but long life tire like automobiles use, filled with new composite type (replaces foam type) material that has been tested extensively, a heavy duty tire for both front or rear tire replacement. The best flat-free tire ever produced for ELECTRIC SCOOTERS. Rides like pneumatic air filled tires, but won't go flat or need air ever!!! PRIORITY MAIL DELIVERY IN 2-3 DAYS TO ANY USA LOCATION, SATURDAY DELIVERY INCLUDED! Handling is added during processing and adjusted or refunded for quantity orders. Never have flats again! This is NOT a hard rubber or plastic tire that will wear out and get flat spots! This is a soft, but long life tire like automobiles use, filled with a composite material that has been tested extensively, a heavy duty tire for both front or rear tire replacement. The best flat-free tire ever produced for ELECTRIC SCOOTERS. Rides like 85 psi pneumatic air filled tires, but won't go flat or need air ever!!! These tires replace all 3.00-4 10 inch tires used on many scooters. No warranty. 5 pounds each shipping weight. Handling is added during processing and adjusted or refunded for quantity orders. Through testing and trials we have now provided an airless or airfree tire that uses a composite material to replace the inner tube. The tire still rides like an pneumatic tire, but it can never be punctured or rotate to cause an innertube failure. We provide these tires in the three primary sizes used on today's scooters: 8" by 2" or metric 200 x 50 mm, 8.5" by 2", and 10" or 3.00-4 metric. These airless tire sizes will replace any scooter utilizing equivalent pneumatic tires and tubes. When you Click the BUY NOW Button you will see the price WITH SHIPPING (HANDLING ADDED LATER) & Handling for the USA (Email for International) added to the item price listed. DISREGARD ANY OTHER PAYPAL SHOPPING CART NOTICES FOR ADDITIONAL SHIPPING! Clicking the ADD TO CART or BUY NOW button to place an order indicates you have read and will abide by the Order Policies as printed on this web site. Information to Consider on Parts, Scooters, and Shopping!